After the approval of the project, there will be the first meeting with every local partner, in each region, to start with organising the responsibilities and programming the project’s activities. During this meeting, we will take decisions concerning the working groups, the basic events and the interface of the website. After the first meeting, individual meetings will be arranged for each local partner, in order to analyse the specific work that has to be done. During the visits, there will be two more meetings of all partners, so that all parts will work together for the main purposes of the project. Each hosting region will have organized some specific activities. The final meeting, in each region, will take place in May, in order to summarize, evaluate and disseminate the project. Questionnaires to assess the evaluation of the project. The COORDINATING REGION organizes and administrates all the activities of the project that will be hosted in Greece, in cooperation with Partner 2. Disseminates all the project activities, experiences and outcomes at every school in the Unit of Florina, in EST database and the mass media. Reserves of the necessary conditions for the hosting of the partner regions. Implement the educational material, in a pilot mode, at the 5th primary school. Teach art through artistic activities. Develop a digital TV channel produced by students. Disseminates the project’s experiences in EST database and media. 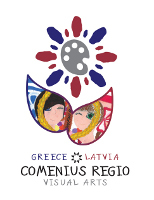 Promotes and improves the partnership among the educational organizations in Latvia and Greece. Organizes museum visits to other districts, for teachers and students, in order to share their experiences. Leads the art workshops designed for teachers. Understanding of the difficulties that may arise, try to overcome them, focusing on the preservation of the cultural diversity.